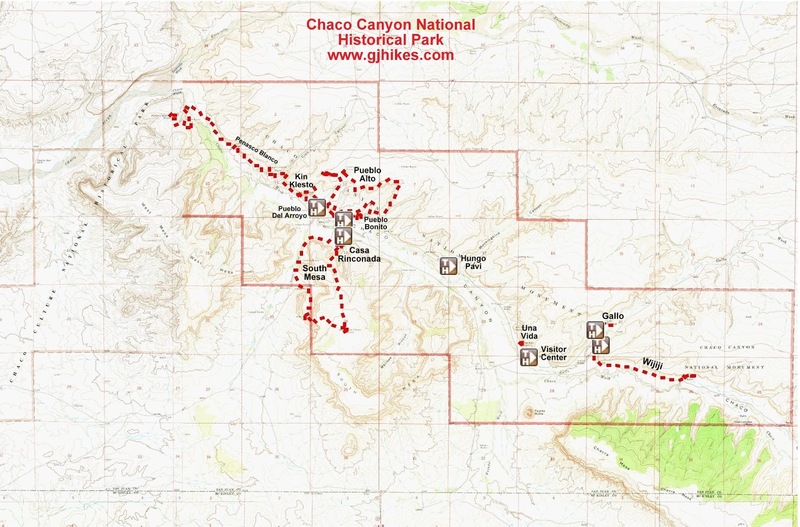 Chetro Ketl is located in the Chaco Culture National Historical Park in northwestern New Mexico. Chetro Ketl is the second largest Chacoan great house covering more than 3 acres. Great houses were designed in the shape of the letter 'D' with multi storied blocks of rooms making up the back and side walls that tapered down to an arced line of single story rooms that enclosed the central plaza. Chetro Ketl began as a single story room block that developed over time into a grand structure. The trail to Chetro Ketl begins at the Pueblo Bonito parking area. The main part of the trail is graveled and can be managed by wheelchairs with some assistance. Trail guides can be purchased at the Visitor Center for 50 cents and at the trailhead where they can be either borrowed or purchased. Chetro Ketl consisted of approximately 500 rooms, numerous kivas and great kivas and a plaza that was elevated 12 feet above the valley floor. From this spot you can look down a wall that was originally a long colonnade. The colonnade was a long narrow room with a row of equally spaced square columns on its open south facing side. The design was similar to that of the Toltec civilization of Mexico. Over time the space between the columns was walled in to create small individual rooms. A very large 'great kiva' dominates the plaza. Huge logs brought from distant forests would have been placed into the circular holes on top of the disc shaped stones for roof supports. The square box between the rectangular floor vaults would have been the fire pit. This is a picture of an elevated kiva that was built within an above ground rectangular room. Another interesting thing to see at Chetro Ketl is a wall with a decorative mural. It is located behind a glass and we were unable to get suitable picture of it but it is detailed in the brochure. A petroglyph panel on the face of the cliff near the Talus Unit looks like it might depict a map of the area. The lines would represent the linear roads that the Chacoans were famous for while the holes may have represented various communities or ceremonial centers where the size of the hole was a reflection of the size of the community. Small pecks could represent various roadside accoutrements or perhaps dwellings. The images could have been the clan symbols for who dwelt at that location. The group of 4 vertical lines on the left could represent a forest. And since it is a desert place travelers would surely need to know where to find water. That is all speculation but they seem to have gone through a lot of trouble to show something. Don't pay too much heed to the exact shape of each image. The white lines are just a rough outline done on the computer using a mouse. On our next trip we will need to take another photo because it appears that we unwittingly cut off the top of the panel. 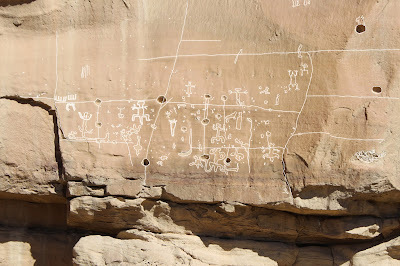 If the previous petroglyph panel was indeed a map then one of those lines would have represented a staircase that ascended a ladder up the cliff behind the Talus Unit or perhaps the roadway and ramp in the box canyon just to the east of Chetro Ketl. This picture was taken from the Pueblo Alto Loop trail on top of the cliff. Chetro Ketl is in the foreground with the Talus Unit at the base of the cliff on the right and further down the cliff in the west the massive walls of Pueblo Bonito can be seen. The Chacoans unique vision of the world is made evident in the architecture of their great houses and the layout of the numerous settlements throughout the southwest that were interconnected by a network of roads. While different sites came and went as the people moved about the land the people still live on to this day, with many of the same traditions and customs, albeit on a smaller scale, as the Hopi, Puebloans and other Indians of the southwest. Chetro Ketl preserves an important part of their history. If you would like to see it for yourself then all you have to do is 'Take a hike'.